Grilling season is here people! Nothing could make me happier. Well, I guess that’s not entirely true, but it does bring a smile to my belly. To kick off the year’s grilling I picked up a beautiful 1.5 pound skirt steak, easily one of the best cuts of any carcass. To start off I marinated the skirt in a mix of 5 tablespoons of soy sauce, 3 tablespoons of sake, 2 tablespoons of mirin, 5 chopped garlic cloves, an inch of chopped ginger, 1 teaspoon of cayenne, 1/2 teaspoon of turmeric, black pepper, and some whole sprigs of rosemary. 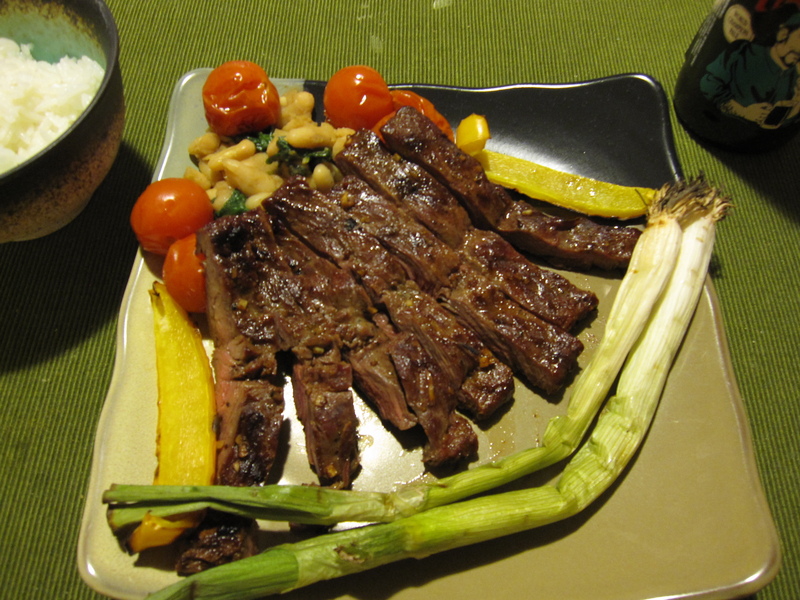 The steak was too long for my biggest dish, so I cut it in half and marinated covered in the fridge for about 4 hours, turning every hour or so. 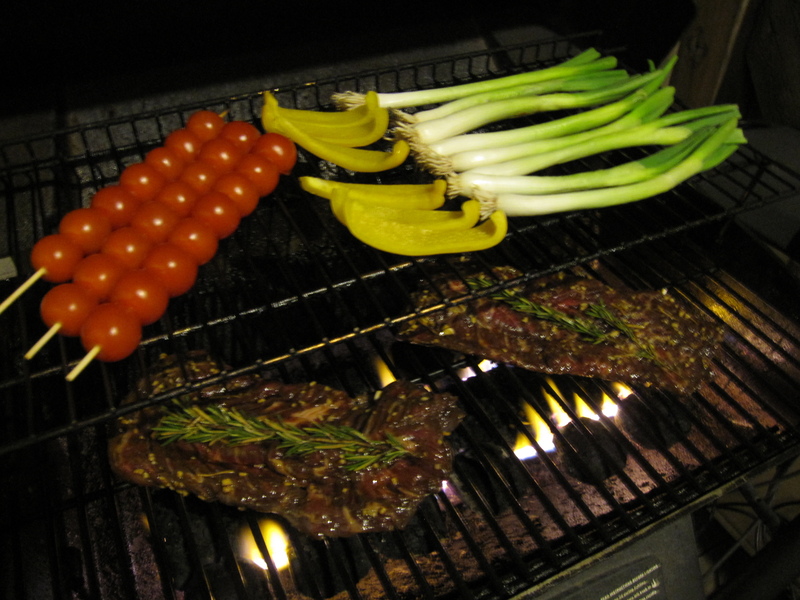 I skewered some cherry tomatoes, cut the yellow pepper that I had left in my fridge, and cleaned some green onions. Stanley’s had real thick green onions that were just screaming to be grilled. when you leave the thicker outer layer on and then grill them as is, the inside becomes real soft and sweet. You can just put the whole thing in your mouth and squeeze out the innards with your teeth as you pull the onion out. So delicious! While everything was on the grill I sautéed some cannellini beans with garlic and spinach. I started with some olive oil and chopped garlic. A few minutes later I added the left-over marinade from the steak and let that boil for a couple of minutes. Then I tossed in a drained can of beans. Once they were heated through I added a bunch of spinach. I stirred it all around until the spinach had just wilted and most of the liquid had evaporated. Then I took it off the heat and covered it until the grill was ready. Once the grill was ready I let the steak rest for about 8 minutes while I plated everything else. Then I sliced the steak with the grains, put them on the plates, and we ate. I also served some white rice.